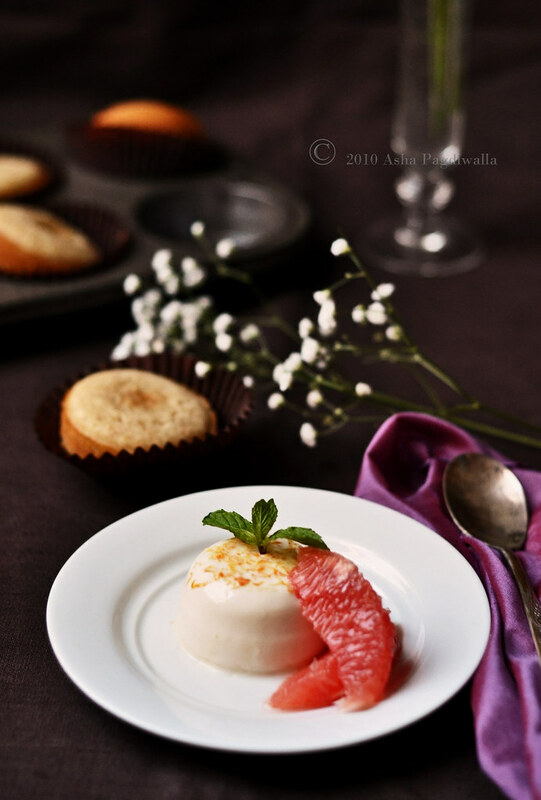 The Citrus Pannacotta was featured Gourmet Live! I almost did not make this DB challenge. As usual, I pushed it to the eleventh hour, which, normally is manageable. But, this time, the elements were not working with me. The sudden and drastic turn in the weather, last week, left me holding my head in my hands, willing the shooting pain to go muss someone else's life. Sigh.. yes, Sinus trouble. After 28 years of free breathing and cooperative nasal passages, I seem to be caught in the throes of a mutiny! I am caught powerless and unable to stem the seige. What is worse, it has the most inconvenient timing! All of last week was a wash out of throbbing temples and ineffective medication :(. So, come Saturday, the 26th, I was still unsure of what the day would bring. To make matters worse, my downstairs neighbor, far too young, was hitting the highs on his stereo and alcohol. At 4 am, I was woken up by my heart thumping irresistibly to the beats of the music reverberating from beneath. After a frustrating half hour of trying to turn a deaf ear, I woke the poor hub to go do the manly thing and get the guy to see sense. Well.. it's hard to drive sense into a stoned out mind! :-O We spent a good amount of time buzzing the guy's door to no response. We guessed he had passed out and had to go back and make the best of it. So the music went on, and eventually, my poor tired body won over my heart's light footed-ness. Nevertheless, when I woke up, my sinus was still an issue. Mr. FSK showed me a grandma's technique for nasal wash and it was somewhat effective, atleast for a while. I decided to make the most of my, what was likely to be a, fleeting luxury of painless lucidity. Searching for inspiration, I reached out to my short stack of cookbooks and came across a recipe by Chef Richard Leach that had me captivated. 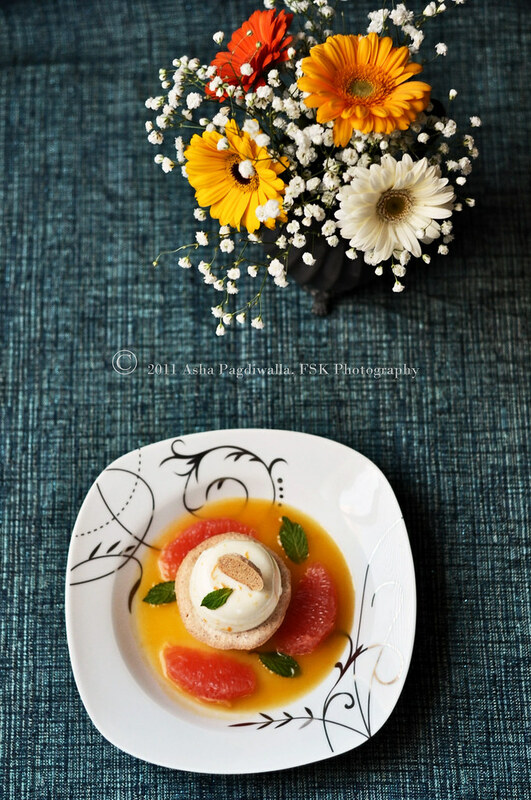 It helped that it was a pannacotta dish, just perfect for this challenge. But, what made it interesting was that it was a beautiful and well thought out plated dessert.. one with multiple components like those whipped out by the best pastry chefs. So, I decided to tweak and adapt it, to make it more approachable. My mind set to the task, I decided to ignore the pangs up North and plowed through it. OK! it was not so bad. 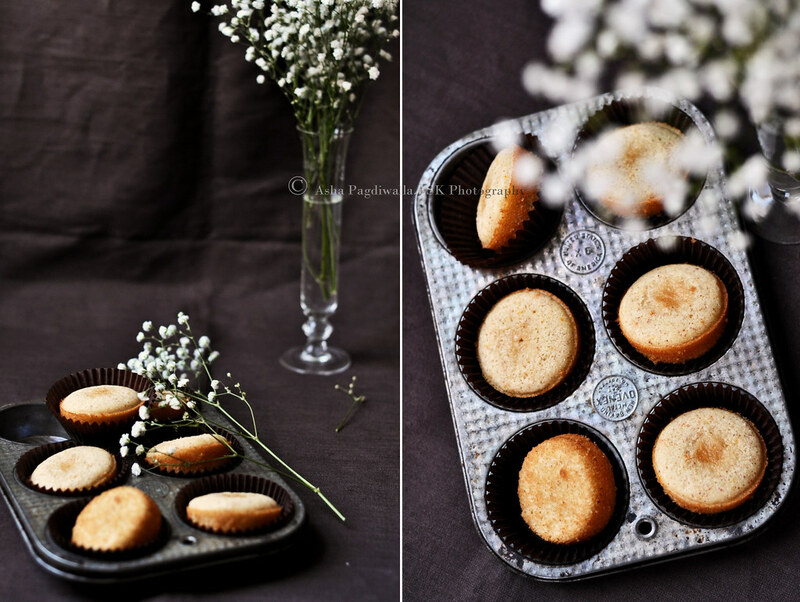 The recipe does have multiple components but they are not so time consuming to put together. It does need a bit of planning but is quite worth it. The warm sponge like cake soaking in the hot citrus syrup forms the perfect counterpoint to the crispy meringue and cold pannacotta. Chef Leach had accompanied a similar dessert with a fruit sorbet and I do think it would have made a great addition to the dessert, making the hot and cold play even more compelling. 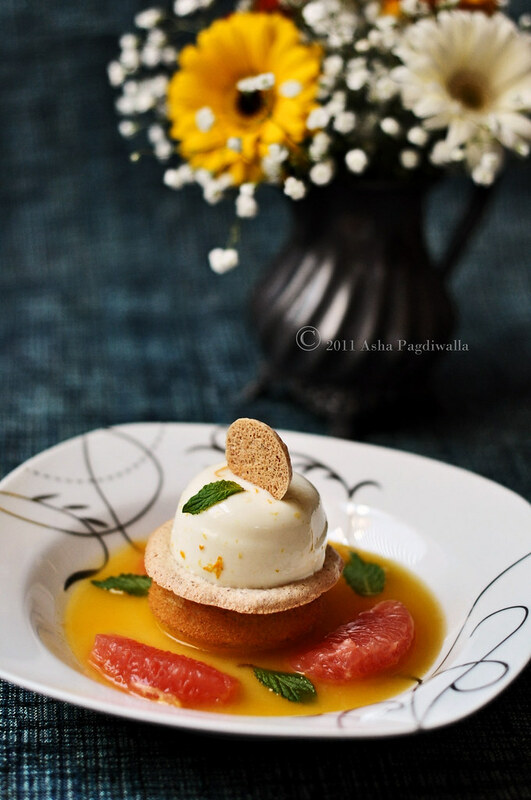 So, let me present my Citrus Frivolous: Orange Pannacotta, Lemon and Poppyseed Semolina Cake and Citrus Sauce. Bring 1-1/5 cups of half and half and all other ingredients other than the gelatin to a boil. Remove from heat and steep for 20 minutes. Meanwhile, bloom the gelatin in the remaining milk. Strain out the lemon grass and most of the zest and add the hot milk to the bloomed gelatin and whisk vigorously to dissolve the gelatin completely. Divide into the pannacotta molds and refrigerate for atleast 3 hours. When ready, run a sharp knife around the edges to release the pannacotta from the mold. Mix all the ingredients except the butter into a smooth batter. Add the butter and mix just until incorporated. 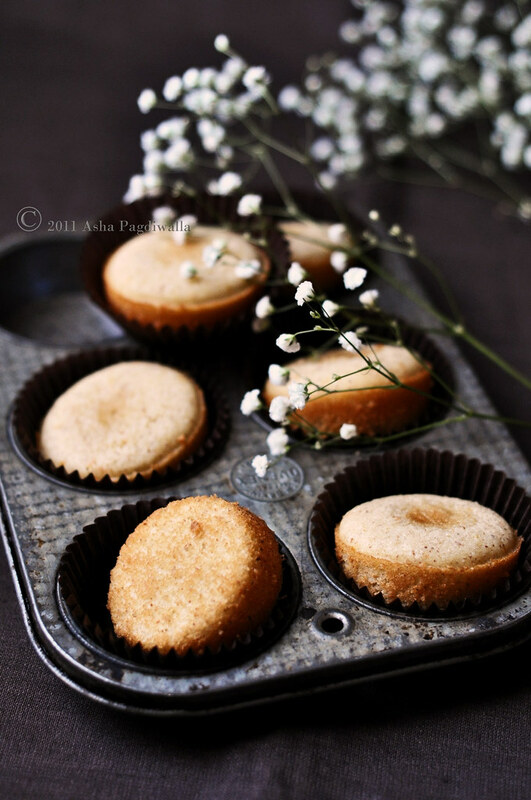 Divide the batter into cup cake molds, filling upto 3/4 level of each mold. Bake at 300 F for 25-30 minutes until golden brown. Remove and cool on rack for a few minutes before releasing from the molds. Whip the whites to stiff peaks. Slowly add the sugar and continue until the mixture becomes glossy and holds stiff peaks. Mix the zest into the almond meal and gently fold it into the meringue just until incorporated. Transfer to a piping bag with a small round tip and pipe out 2.5 inch disks of about 3 mm thickness on to a silpat. If you have a stencil, it works best. Bake at 260 F for 20-30 minutes until golden brown. Cool and carefully peel off the disks. Store in an airtight container. Bring everything to a boil and keep it rolling for 45 seconds. Remove from heat. Make this just before serving. Place a semolina cake at the base of a shallow soup bowl. Place a meringue disk over the cake and top with the pannacotta. Pour the citrus sauce until it comes up to 1/4 the height of the cake. 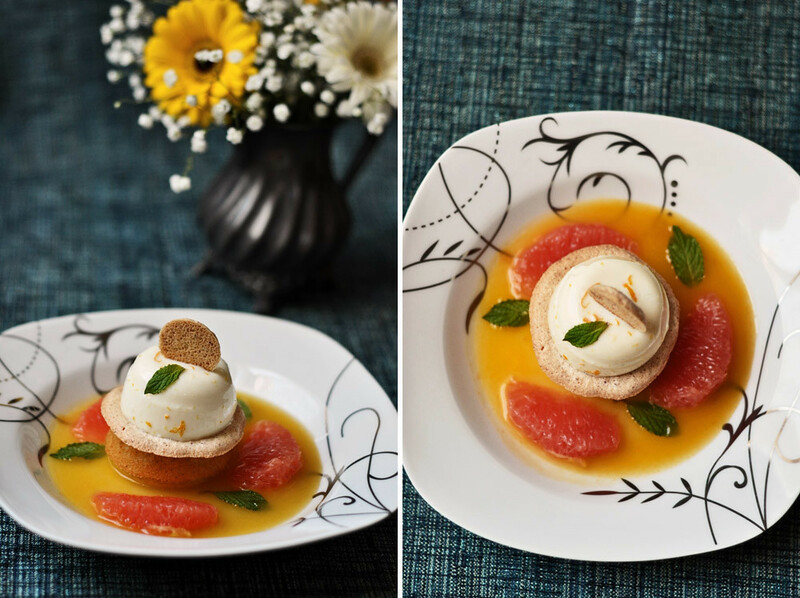 Serve with slices of orange or grape fruit, mint and a fruit sorbet (optional).